We are happy to announce that GO Group was able to organize three panels for an event regarding the finnish events and festival scene. As part of the national “JOHDE 2010 – 2013” project the seminar on may 2nd at the Musikkitalo (Auditorio, 10 – 16h, Mannerheimintie 13 A, Helsinki) will show what GO Group is all about: Sharing best practise, bringing together people from different countries, showing different angles to view from. Main topics will be communication, mobility and catering. The session will be in English and hosted by GO Group’s very own Holger Jan Schmidt. If your finnish is good enough go here for more information. The participation fee is 30 Euro. We are looking forward to meeting new and interesting people in Helsinki and talking about how to run oerations greener, smarter, more sustainable. 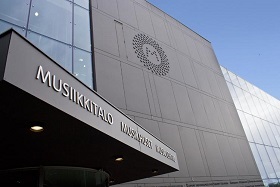 Partners of this event are among others the Sibelius Academy (which the Musiikitalo is a part of) and the University of Turku. You can find some pictures from the seminar in Helsinki here.